As an exercise to learn a new software package he’d bought, Stewart Copeland went through fifty hours of home movies he shot of his band, The Police. Doing so reminded him that despite a reputation of fighting between band members, The Police was a tight nit group that worked hard and had fun. Stewart spoke to me from his studio about the upcoming release of a DVD he produced from his home movies, Everyone Stares: The Police Inside Out. NOTE: Everyone Stares is dedicated to the memories of Kim Turner (Tour Manager for The Police) and Stewart’s brother Ian (Booking Agent for The Police). Click here to listen to an interview I did with Ian in June 2005. Stewart Copeland: Hi! This is Stewart Copeland and you are listening to your computer. It’s tuned to Electric Sky. [Portrait theme music] Podcasting visual insound, this is another edition of Portrait on Electric Sky. Mark Blevis: What if you had fifty hours of home movies that documented a life of yours that was a lifetime ago? I’m your host Mark Blevis. On this edition of Portrait, drummer, composer, Rock and Roll Hall of Famer, and creator of the new film Everyone Stares: The Police Inside Out, Stewart Copeland. Stewart Copeland: That shot is the first mob scene that we had of that kind. There is a distinction that needs to be made here, which was a surprise to me when I looked at this footage. We over time developed a lot of credibility as musicians, that our music was considered important and that we were — that our music had substance. We’re all very proud of that. What we have forgotten is that one of the greater leaps in our progress; which felt like to us inch by inch up the ziggurat, some of the steps were larger than others. One of the largest jumps in our fortunes was our first breakout with chart success in England as a boy band; as a bubble gum teeny bopper phenomenon; as pinups; and that audience there, those crowds, those mob scenes there are the result of that profile. The bands that have been substantial bands, you know from Led Zeppelin, Nirvana, Tool, whatever, they have a respect from their fans, but it doesn’t verge into that hysteria that you only get with teenage girls who are inflamed by youthful passion, and three blonde heads in that case. So, those shots there; that’s our first time that — we had no security staff, we had no — you know, there was our roadies. We had no idea, when we walked out that door, I am walking right behind Sting and we can hear this kind of noise out the door, the door opens, Oh my, God! It’s right there in full frenzy with that high pitched shriek of those young girls. And if piranha fish could make a sound, that is the sound they would make. And I loved the shot because it gets the bedlam out of it. We can’t even see the car. “Where’s the car, Kim?” “It’s right there!” So we make it into the car. As soon as we are in the car and the door closes behind us, the screen goes black and you can hear us hyperventilating and you can see all the — then you can make out, gradually you can make out all the faces pressed against the glass. That moment is just perfect palatically for my movie, because that is the beginning of the gold fish bowl, where they’re pressed up against the glass looking in at us and the first weave of the cocoon is beginning to weave itself around us, the first layer of the cocoon. Later on, when we were more just passionate about it and it was just part of our work environment. Mark Blevis: It seems that every few years a jewel of Police memorabilia leaks out to the public. Is the movie intended to be one of those — keep up that tradition? Stewart Copeland: No, in fact I have not been aware of such a tradition. I’ve pretty much forgotten about the Police and I have assumed that everyone else had as well. Of course, the catalogue division deep within the bowels of whatever company bought our record company, you know, they do that stuff and I guess I enjoy the royalties derived there from, but I’m certainly not aware of it. There is not really much to regurgitate other than repackaging the greatest hits of them, which I believe they have done at least twenty times by now in the last twenty years. If you say every two years that sounds about right as far as that goes, but this really doesn’t fit into any that at all. This is something that I originated and took to them and comes from the other direction. Mark Blevis: Now, is this your answer to a book? Stewart Copeland: No, not at all. None of these important sounding things. It was pretty much a lucky accident. I discovered that I had this material which combined with the advent of personal computers, Final Cut Pro, and cheap memory — that is to say hard drive memory — that suddenly it became possible to play with the stuff that I had had sitting in shoe boxes for years and I was just playing with it pretty much for my own amusement. I got this new software, Final Cut Pro, and I was reaching around for something to play with it, on it, and these pictures hoved into view. So I started cutting a whole movie. Then, came Sundance [Film Festival] and my little home movie, my little toy escaped from the playpen and became product. Mark Blevis: Now, when you were going through the footage, what kind of memories did you go through? What kind of emotions did you go through? Stewart Copeland: Mostly glee over the exciting quality of the images that I had to play with as I made my little home movie. You know, a dad carving up his home movies of his son in the football game is full of a similar form of glee when he actually got the shot where his son caught the ball and ran with it and scored! That happiness that a dad would feel having got that shot is what I felt as I looked at all the stuff that I had as this amazing adventure unfolded before us. At the time, really the motivation at the time was — you know, one analogy is the dad with his home movie camera — the other is a tourist. We were tourists on our own adventure and we all had cameras. Andy had a stills cameras and Sting had a mild camera obsession, but nothing like Andy’s. We were taking shots, snap shots, of this incredible adventure because it was almost too much to believe with our own eyes so we would take pictures of it and stuff it in our suitcases to play with later. Mark Blevis: It’s twenty-two years since the last piece of footage from that movie was actually recorded. Mark Blevis: So you could be the father of that Stewart Copeland that is in the movie? Who is that Stewart Copeland? Stewart Copeland: Well, I am the father — you know — my son Patrick fits perfectly into that scenario you just described. Looks just like me, too. What was your question? Mark Blevis: Who is that Stewart Copeland when you look back on that person? Stewart Copeland: He is a wild out of control twenty-five year old rock star, in the middle of the hurricane. The film was shot by this twenty-five-year-old rock star and edited by a fifty-four-year-old father of many. Mark Blevis: Do you have any advice for that guy? Stewart Copeland: Yeah. Lighten up, dude! and I want to know what this life is for. Stewart Copeland: This is really goofy and I wish I had a sexier answer for you, my kids. Now, that is an answer entirely lacking in mystique and charisma and yet that is the honest answer to your question. I have seven kids. That’s the meaning of my life. Mark Blevis: And how old is your youngest now? Stewart Copeland: My youngest is — well they range from thirty-something to twenty-five, twenty-three, twenty-one, thirteen, eleven, and seven. I can’t remember all their names, but I’ve got a mnemonic for remembering their ages. Mark Blevis: For Stewart Copeland, when is the ride over? Stewart Copeland: Oh, my personal ride, I’m just getting started. I’ve discovered the meaning of life for me and it’s taken a while, but I’m on it. Mark Blevis: Show notes and links to resources discussed in this episode can be found on my website, electricsky.net. While you’re there be sure to check out my podcast archives. The theme song for Portrait is Bigfoot by Robert Farrell. Electric Sky is a proud member of the Rogic Podcast Conglomerate. Thanks for listening and please stay subscribed. Thanks so much for this great interview, Mark! Thanks, Marcie. I have some outtakes which will end up in my ES2 feed at some point. I’ll announce it on my site when I post that. Feel free to digg this post. An icon for drummers, musicians, and soon home-filmmakers, Stewart Copeland talks about the Police, the new movie and even reveals the meaning of life. Wow! Mark, you always do a great interview show, and this one is top notch. I definitely “dugg” (digged?) this one. You took me down memory lane Mark! All the excitement of the ‘Police Picnics’ at Exhibition Stadium in Toronto came to mind…what a time it was! You’re killing me, Vivian. 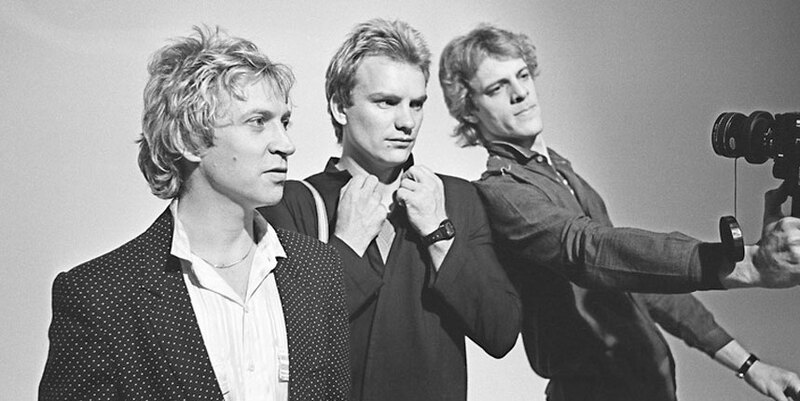 The Police are my favourite band and I never had the chance to see them perform. Ah..this is where my age shines through…I’ll have to see if I can find my Police memorabilia to share with you at PAB2007! Great, Mark! Clever questions, really cool vibe…that’s a must to listen to for every Police and Stewart fans! i can’t believe you got this!!! So there are cool podcast interviews, there are cool guests, then when they come together. Bravo man. That was awesome. The cool thing is the different type of questions asked, you know, this was not your typical rock and roll or celebrity fawning interview. The Copelands responded well to it. Hey I used ‘bravo’ in a sentence, well there is a firt time for everything…. Great interview! It’s nice to hear a voice that isn’t driven by mass media. The conversation was fresh – very different from anything I’ve heard with celebrities of this calibre. What a great interview! Mr. Copeland is funny and informative as expected. I missed his interview in Cleveland last year (I found out a day late). I have a good friend who works there but he was on vacation and forgot to tell me about it! Ever since that day it’s haunted me that I missed it. I never did get to see The Police play live but just getting to hear Stewart talk is something better than not. Can’t wait to see the film…I’ll bet it’s incredible! Maybe he could show it at the Rock Hall sometime? :) Always looking forward to anything from Stewart and the Police! Another great piece of work! It is great to hear a legend speak like a normal everyday person. Great interview! I’m such a fan of the Police. I saw them live in the late 80’s when they toured for their last album. Their music really was the soundtrack for my late high school years. It’s cool the way all of the band went on to do massively different creative things. Thanks for the comment, Kevin. I was never fortunate enough to see The Police perform. My audio production capabilities are nearly back to 100%. There will be a new Portrait published this week. I love this. It’s too bad it took me so long to find it, but I love the questions. Especially the part about the older SC looking back at the younger SC and giving him the advice to “lighten up”.